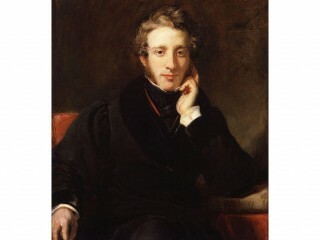 British author Edward Bulwer-Lytton wrote Falkland, Pelham, and Eugene Aram. These novels won instant success and made him a wealthy man. As a result, he entered Parliament as a liberal member representing St. Ives, Huntingdonshire. Bulwer-Lytton remained an active politician yet still found time to produce many novels, plays, and poems. According to his baptismal certificate, the full name of this once famous author was Edward George Earle Lytton Bulwer-Lytton. He was born in London May 23, 1803. His father was a Norfolk squire, William Bulwer of Heydon Hall, colonel of the 106th regiment (Norfolk Rangers); his mother was Elizabeth Barbara Lytton, a lady who claimed kinship with Cadwaladr Vendigaid, the semi-mythical hero who led the Strathclyde Welsh against the Angles in the seventh century. As a child the future novelist was delicate, but he learned to read at a surprisingly early age and began to write verses before he was ten years old. Going first to a small private school at Fulham, he later attended school at Rottingdean, where he continued to manifest literary tastes, Lord Byron and Sir Walter Scott being his chief idols at this time. Bulwer-Lytton was so talented that his relations decided it would be a mistake to send him to a public school. Accordingly he was placed with a tutor at Ealing, under whose care he progressed rapidly with his studies. Thereafter he proceeded to Cambridge, where he earned his degree easily and won many academic awards. After graduation he traveled for a while in Scotland and France, then bought a commission in the army. He sold it soon afterward, however, and began to devote himself seriously to writing. Although busy and winning great fame, Bulwer-Lytton's life was not really a happy one. Long before meeting his wife, he fell in love with a young girl who died prematurely. This loss seems to have left an indelible sorrow. His marriage was anything but a successful one, the pair being divorced comparatively soon after their union. His first publications of note were the novels Falkland, Pelham, and Eugene Aram. These won instant success and made the author a wealthy man. As a result, he entered Parliament as a liberal member representing St. Ives, Huntingdonshire in 1831. During the next ten years he was an active politician yet still found time to produce many stories, such as The Last Days of Pompei, Ernest Maltravers, Zanoni, and The Last of the Barons. These were followed by The Caxtons. Simultaneously he achieved some fame as a dramatist, perhaps his best play being The Lady of Lyons. Besides further novels, Bulwer-Lytton issued several volumes of verses, notably Ismael and The New Union, while translating works from German, Spanish, and Italian. He produced a history of Athens, contributed to endless periodicals, and was at one time editor of the New Monthly Magazine. In 1851 Bulwer-Lytton was instrumental in founding a scheme for pensioning authors and also began to pursue an active political career. In 1852 he was elected conservative Member of Parliament for Hertfordshire and held the post until his elevation to the peerage in 1866. He became Secretary for the Colonies in Lord Derby's ministry (1858-59) and played a large part in the organization of the new colony of British Columbia. He became Baron Lytton of Knebworth in July 1866 and thereafter took his place in the House of Lords. In 1862 Bulwer-Lytton increased his stature by his occult novel entitled A Strange Story. Toward the end of the decade he began to work on another story, Kenelm Chillingly, but his health was beginning to fail, and he died on May 23, 1873, at Torquay. Even as a child, Bulwer-Lytton had demonstrated a predilection for mysticism. He had surprised his mother once by asking whether she was "not sometimes overcome by the sense of her own identity." Bulwer-Lytton's interest in the occult increased, and it is frequently reflected in his literary output, including his poem "The Tale of a Dreamer," and in Kenelm Chillingly. In A Strange Story he tried to give a scientific coloring to old-fashioned magic. Bulwer-Lytton was a keen student of psychic phenomena. The great medium D. D. Home was his guest at Knebworth in 1855. Home's phenomena greatly aroused his curiosity. He never spoke about his experiences in public, but his identity was at once detected in an account in Home's autobiography (Incidents in My Life), "Immediately after this another message was spelt out: 'We wish you to believe in the … ' On inquiring after the finishing word a small cardboard cross which was lying on a table at the end of the room was given into his hand." View the full website biography of Edward Bulwer-Lytton.